[LEL17] Anyone else going tubeless for LEL? Re: Anyone else going tubeless for LEL? I've ridden 10,000km on Pro-One 28s and Orange Sealant, including a 4,000km TCR with several gravel sections. I've had 2-3 nicks that sealed themselves and that's it. They're very grippy and seem durable for 4,000-5,000km on fair roads, plus the rolling resistance figures are very good. It's easy to be a fan if you've never had a problem, but that's a reasonable amount of testing to develop confidence in some tyres. 1400km in on pro-one 28c running doc blue and they seem to be going fine. I'm a lightweight 94kg with 17kg of iron bike so it's a fair load but they seem fine at 60 psi. I think my previous poor experience may be due (at least in part ) to inflation with CO2 which I read elsewhere renders the sealant ineffective. Not sure I can get adequate clearance under the mudguard with a 28 on the back, so may have to get a 25 for that. Still carrying spare tyre (after a catastrophic sidewall failure beyond the capacity of any boot some years back), tubes, levers, patches, pump, kitchen sink etc. Sealant doesn't like the shock cold temps created by the CO2. It is supposedly the alkali PH that will cause the sealant to semi-set and then be ineffective at sealing holes. That's interesting. I wonder if it's possible to produce (or buy?) a sealant-friendly inflation cartridge? Apparently the Effeto Mariposa Caffelatex sealant doesn't suffer from the issue. I'm now also considering the tubeless options again after all my woes. A switch to 650b wheels and 47mm tyres mean much lower pressures so has to be worth a try.....all to be confirmed yet as I am still waiting on the wheels to come. Good to know, but I think it'll take a lot to woo me away from Orange now. That stuff seals really well and lasts twice as long as the next best gloop I've tried too. Not for me. I've ridden tubeless for the last 18 months, and covered approx. 10,000 miles and while I was initially convinced, I have now concluded that it is not the right choice for multi-day rides on a road bike. I have ridden a pair of Hutchison sector 28s and three pairs of Schwalbe Pro-Ones. The latter being used on the TCR and the Indy-Pac. The Sector 28s proved durable nut were sketchy in the wet and quite heavy. The Pro-Ones were initially a joy to ride, light, low rolling resistance, good grip and lovely cornering (they hold a nice shape on most rim widths). However, they are not durable. They are soft and wear rapidly and I have also concluded that there is an ageing of the rubber over time. Pro-Ones that I bought less than 12 months ago have recently become badly cracked and have lost small chunks. I think this could be a consequence of the bonding process that secures the air-tight lining. 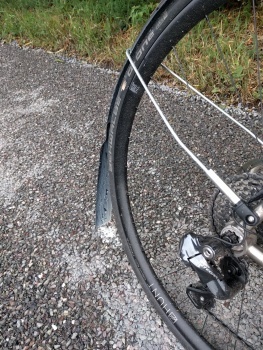 There is no doubt that some potential punctures have self-sealed and I was able to run a lower, more comfortable pressure with less concern about pinch-flats. However, I have suffered three separate failures where the tyres have not self sealed (or have self sealed only once almost flat and then leaked again as soon as I have put air back into them). On two of these occasions I have tried unsuccessfully to repair with the Genuine Innovations Tubeless repair kit and have then resorted to a tube. Fitting a tube in the field is not as easy as you might think due to the remaining latex on the tyre and wheel and the sealing tape which make it very difficult to get the tyre properly seated up on to the shoulders of the rim (a lot of pressure is required). I have been using a Lezyne Road Drive pump to inflate but despite pumping as hard as my biceps and the burning heat of the pump can tolerate, the tyre has struggled to fully climb onto the rim. I've ended up inflating, deflating and rocking and rolling the tyre and even then struggled to get it properly fitted (on both Mavic Open-Pro and DT Swiss RR511 rims). This might be resolved if you carry a CO2 pump but for a multi day ride you would also still need a pump or several gas cannisters as back up. So, given the problems I have experienced, I just don't feel the advantages outweigh the problems that can arise. I'm therefore back running tubes and carrying a pump and patch kit. I know I can keep rolling reliably with this set-up. Incidentally, I am convinced that tubeless has a place on my CX bike. ... not the right choice for multi-day rides on a road bike. Interesting. What clinchers are you going to use? Agree about the Pro One longevity, my rule of thumb is 2,500 km lifetime for a rear; 5,000 for the front. I had success with the Sector 28s and am probably too cautious a rider to have discovered their sketchiness. One big surprise I had was when switching from Pacenti SL rims to H Plus Sons "The Hydra" - a quite different experience. The HPS rims are easier to mount the (Schwalbe) tyre onto but when deflated the tyre will always ("pop") demount from the rim, unlike on the Pacentis. With the G One Speed there seems to be a really good rim/tyre affinity. The tyre goes on with thumbs alone and "gapes" open in just such a way the bead is already sneaking into position. A roadside pump is enough to get it to ("pop") seat onto the rim. For this reasons I have changed my mind and am going to use these tyres (and not Pro Ones) for LEL - in the event of a demounted tyre there's a good chance of reseating it on the road (and if not, I have my clincher/tubes to hand). In general I think this illustrates an aspect of tubeless use: you need to be really familiar with the precise set up you have: the way the tyres, rims, sealant, tape, valve cores, repair kits and pumps work together. This is quite an overhead. Tubeless: when it's good it's very very good, but when it's bad it's horrid. Tyre choice is important when going tubeless. I`ve found the Schwalbe S ones superb for Audax, they`re 30mm wide, I can run the front down to 45 psi which has cured any hand discomfort or hand numbness after rides, they`re supple and fastish and the pimply tread has been good over the winter on gravel tracks or muddy lanes. They`re quite robust and I`ve only suffered one big puncture caused by a 2mm flint, sealant was spraying over my head as the wheel rotated but the hole eventually closed. The rear S one is pretty worn now and I have some 28mm pro ones I intended to use for LEL, superfast, but as Shell has explained these are really racing tyres and may not be durable enough for long distance, multi day events. I was very happy with my tubeless set up for LEL. H Plus Son rims, Stans tape and sealant and Sector 28 tyres. 1443km with no problems, and the ability to run a lower tyre pressure for some relief on the terrible road surfaces in parts. The older you get, the better you get, unless you are a banana. Well after the last 200km before LEL I now know what a visitation sounds like on tubeless - thinking I had some mud stuck on my tyre hitting the guards, I stopped after the third time of hearing it to clean off the offending mud... that's when I found my rear mud guard dripping in sealant! I popped off the tyre when I got home to replace it in advance of LEL and this was what had caused the issue, it had worked it's way through the tyre and in to the rim space! So on the basis of the above I recognised perhaps one visitation during the whole LEL ride - quite happy with that!! I had 3 hissy punctures on my Shwalbes and 1 on my hutchinson. I used some flexible superglue on a couple of cuts and the outside of the punctures after they sealed. Never had to stop riding or use the emergency CO2. I think there is a place for some emergency sealant bottles as i suspect my front tyre with three punctures would be empty of sealant. A little squirt bottle of 50-60ml with an inserter nozzle could easily be carried. A sealant that does not react to CO2 would also be helpful. I rode LEL tubeless with (surprisingly) absolutely no issues, the previous months setting up and, using road tubelesss had been fraught with negative experiences but, instinct told me that I should continue to give it a try. A new schwalbe one pro on the rear a week before the event and, a top up with orange endurance was the only prep, I did, despite severe provocation and, an occasional bit of cyclo cross, the tyres / set up were perfect and, really required no attention for the whole event, fantastic averages and, minimal numbness in hands tells me this was the right thing to do. Both needed tubes to sort. It would be really helpful (well, I think it might be) if people said whether the punctures were on the centre of the tread or the sidewall. Schwalbe G-One Speeds with Caffélatex Effetto Mariposa sealant made it round LEL for me with zero incidents. These are *the* tyres for UK roads/weather so far as I am concerned. 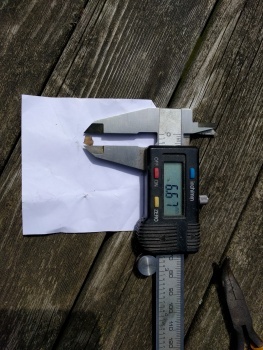 I used tubeless Schwalbe Ones (28mm) with no significant problems: the front (on a newly built A23 rim) lost pressure between every control on the way to Moffat (going from approx 70 to 40psi) but had decided to stay up by the time I got to Edinburgh, while the rear (on an Open Pro) showed no such misbehaviour. No punctures that I noticed, though I was still carrying three tubes just in case ... Tyres had probably done about 2000km before I started, and still look barely worn-in. Compass Jon Bon Pass (35mm) with Schwalbe Blue at 2.4 / 2.8 bar. Front wheel felt a bit soft on two occasions; when I checked at the next control, pressure was down to a bit below 2 bar. Front wheel was about 7000km old, rear about 400km. Alex , just in case I change my mind what flavour of speeds where these? For me, the jury's still out on them. I got going with tubeless before last year's Wild Atlantic Way, and (as well as mileage beforehand with one significant puncture) did about 1500km of that route with one puncture that I noticed on the rear (sealed no problem en route), but had to put a tube in the front after about 800km - I hit a pothole, think I spilled some air (it would almost certainly have been a pinch flat on clinchers), and didn't add air when I got to that night's sleep control. Running on an Open Pro probably didn't help, and by the morning, the tyre was flat and in a puddle of sealant. REASONS meant that I finished the route on a different bike and in fact didn't ride this one again until registration day for LEL: I'm very happy with a couple of minutes of pump faff at each northbound control considering the tyres didn't pick up any punctures that I noticed, and are still at a rideable pressure. I'll top them up next time I use the bike, but after a few days I'd probably do that on clinchers anyway.